“This is the 2nd time these lovely guys have performed for us. 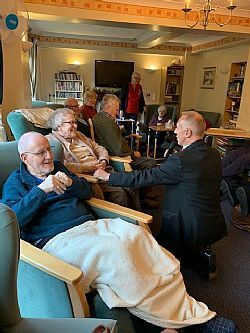 It’s so lovely seeing our residents singing along to some lovely songs, it’s funny how they never seem to forget the words to some of their favourite songs, tapping their feet with a smile on their faces and a twinkle back in their eyes. Our families are always invited and seem to enjoy the moments just as much! Days like these are a team effort for us with a chance to lighten the mood and have some fun together”. If you have a friend or relative at The Old Vicarage Care Home in Northamptonshire please do come along and join in at one of our events, we would love to have you visit!